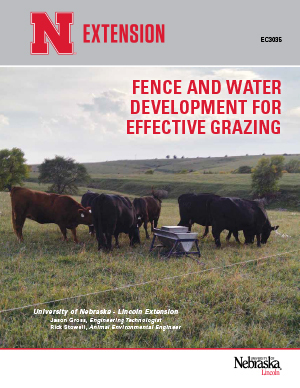 There has been much interest in grazing alternative grasses and forages outside of native ranges. Grazing irrigated grass and annual forages, such as cover crops, can not only improve soil health and reduce soil erosion, but add grazing days to an existing operation. Grazing systems that include perennial grasses and cover crops, which were grown as a standard practice generations ago, have come back onto the farm. In order to graze grasses or cover crops on fields that have not been grazed in generations, there will have to be developments of fence and water system infrastructure in order to house and properly care for the livestock.